With over 400 people in attendance, Jazz@4, the School’s Senior jazz band started off the festivities. Then, Headmaster Stuart Grainger spoke about the background and vision for the space and Head Girl Jessica Uruchalu described the difference the new facility has made in the lives of students. Former TCS Governing Body Chair, Adam Howard ’76, officially announced the naming of the space as Cirne Hall, in honour of lead donor Lewis Cirne '89. His gift of close to $10 million was made in conjunction with the Beloved in Christ Foundation, an organization he founded with his wife, Kirsten. It is the most generous donation in TCS history, with $3 milllion designated to the construction of Cirne Hall and the balance funding four new endowed scholarships for promising students. Tim Kennish ’58, co-chair of the 150th Anniversary Campaign cabinet, thanked all of the donors who made this new $9 million space possible. 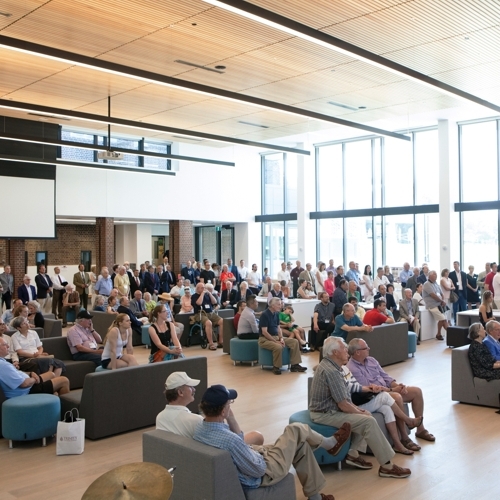 Cirne Hall includes the newly renovated library, main reception, guidance and academic support areas, administrative offices as well as our spectacular new commons space, now formally known as Cirne Commons. Following a reading by Head Boy Andrew Boughner, Lewis Cirne made some very touching remarks, for which he received a standing ovation. He talked about his journey to TCS as a young boy thanks to his family's sacrifices and the generous bursary he received, which instilled in him the importance of giving back as a student at TCS, and his many blessings in life and in business. After the ceremony, guests were invited to tour Cirne Hall, and several room dedications were held including spaces named for the classes of 1982, 1993 and 1961, George Booth ’61, Brian Cartwright ’86, and the families of Keng & Jackie Fong and Emanuele & Maria Di Pietro. We look forward to dedicating several other areas in the hall in the near future, including the Price Academic Support Centre, and spaces named for the Hawkins and Glassco families. Read more about Reunion Weekend 2016. View the Cirne Hall Dedication ’16 gallery for more photos. Watch the Cirne Hall before and after video. Watch the Cirne Hall: Thank You to Lewis Cirne '89 video.